Here’s the thing: I might be a little dramatic. I might use super-describers like magic and miracle and unbelievable to describe my favorite recipes. Regularly. This is all true. But when I say life changing soft scrambled eggs? I literally mean life changing. These eggs changed my life because – please withhold judgement – I used to NOT EAT SCRAMBLED EGGS. I know. I am not a picky eater, but scrambled eggs were one of a total of, like, three ingredients on my food black list. But scrambled eggs were always gag city for me until I was introduced to the soft scramble and, obviously, MY LIFE CHANGED FOREVS. I now default to scrambled eggs on what-to-make-for-dinner nights. I now make easy meals with an added bonus of super nutritious protein within 90 seconds. I now feel like a legit home cook. Credit for this major life transition into scrambled egg adulthood goes to a few peeps. Shauna Niequist who made me weak in the knees with her description of soft scrambled eggs with goat cheese in the book Bread & Wine (<- affiliate link). That’s right, I started my journey way back here. Bon Appetit, who not only wrote a nice post about soft scrambled eggs, but also shared a quick little video of it on their Instagram and made me realize that maybe I *could* like scrambled eggs after all. The pan. This is key. Please use a high-quality nonstick. It’s the easiest. My preferred brand of nonstick is Swiss Diamond (that’s what we used in the video), but at home, Bjork and I have a cheaper tiny two-egg sized nonstick probably from Target that is just our designated egg pan. The fat. I know, health and everything, but you really need a little bit of fat in that pan to help the eggs move around. (Also – yum.) I highly recommend butter. We’re not talking about a lot of butter here – just enough to coat the pan and help the eggs hold together in soft, fluffy folds instead of sticking to the pan. The spatula. A rubber or ideally silicone spatula is a must. The flexibility of the spatula allows you to hug the contours of the pan and get a really clean swipe/fold each time you push the eggs around. The eggs. Good eggs are worth it. I normally shop at mainstream grocery stores, but my favorite is when I have a chance to pick up eggs from Whole Foods because they source them from local farmers and the eggs are vibrant and beautiful. Same idea if you have access to a farmers market, a homestead-y friend, a chicken… egg quality matters. The heat level. 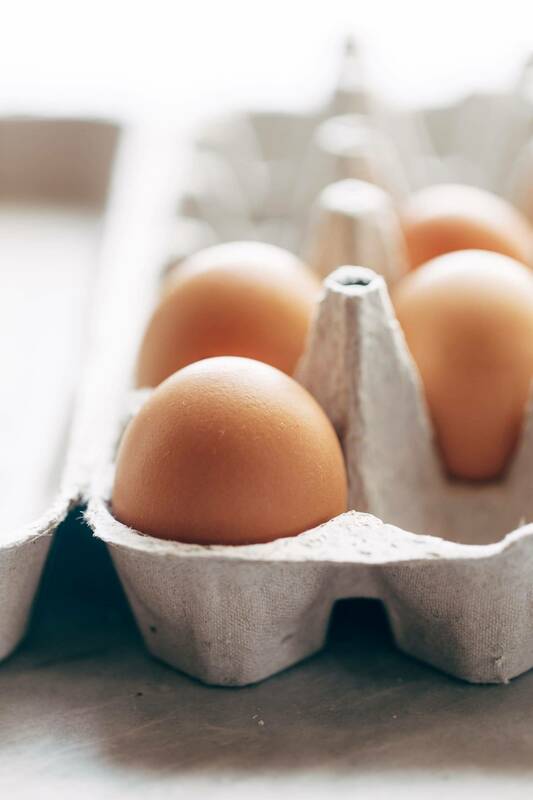 We want MEDIUM LOW heat going on for these eggs. Too hot and they’re going to get dried out, or, I hate to even say it, browned. 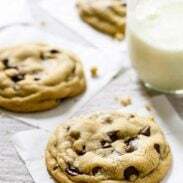 Keep that heat high enough to get ‘em cookin, but low enough to keep the creaminess. What does a person do with a soft scramble? Allow me. Today is your day. Prepare for the soft scramble to change your liiife. These soft scrambled eggs are so easy and SO dreamy! 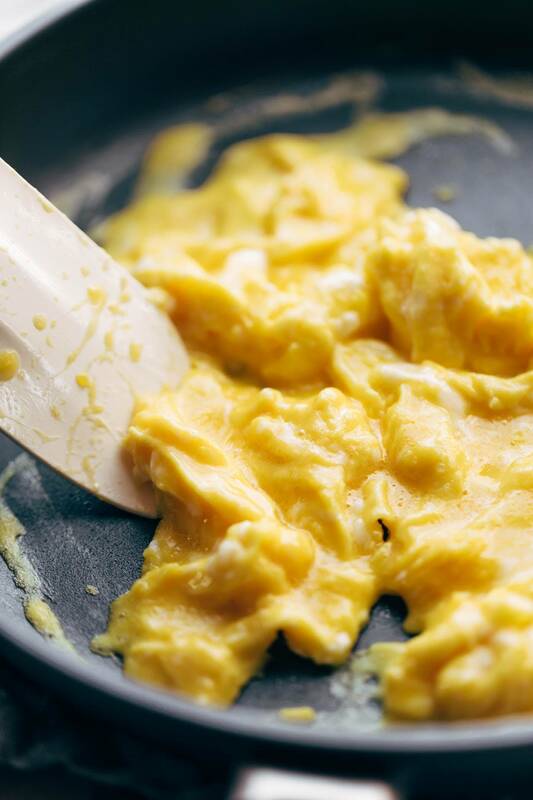 Four quick and easy secrets to the best scrambled eggs of your life. Melt the butter in a medium sized non-stick skillet over medium low heat. We want the butter to pretty much coat the whole pan. Whisk the eggs. When the butter is just barely bubbling, add the eggs to the pan directly in the center so that the butter gets pushed out to the sides. ZERO STICKAGE. This is good. Watch for the edges to just barely start to set, and then gently swipe a spatula around the edges of the pan to create large soft curds. Don’t flip the curds over. Continue this process, pausing in between to allow time for the eggs to cook but working quickly enough so as not to overcook the eggs, just gently pushing/folding the liquid eggs to form curds. The entire process should take 2-3 minutes or less. When the eggs are barely set and you have some big folds of heavenly soft scrambled eggs laying in the pan, remove from heat. Serve on a breakfast sandwich or with your bowls or just by themselves. SO. AMAZINGLY. GOOD. When in doubt, go lower with the heat. The eggs will go from perfect to overcooked in a matter of seconds so watch it closely! More pushing around in the pan = more tiny pieces of eggs. I like the bigger soft-cooked pieces so I try to reduce my amount of spatula-pushing. WATCH THE VIDEO. It helps to show the process and what the eggs should look like. Soft scrambled eggs all the way! I never even knew this existed until I moved to England where this is the de-facto standard. A few extra tips that I’ve picked up along the way for creamy egg goodness. In Britain they ALWAYS make their scrambled eggs in a small pot. Seriously! And ALWAYS on a super low heat. The pots stops the eggs from cooking too quickly. I still use a rubber spatula to keep things moving, but my friends swear by a whisk. This helps the eggs stay separated and not overcook in any given area. It is the final step which is the game changer. Stir in a small splash of cream as soon as you take the eggs off of the stove to stop the eggs from cooking further. This then adds an extra layer of velvety goodness. Okay I am intrigued by the whisk idea. Must try! 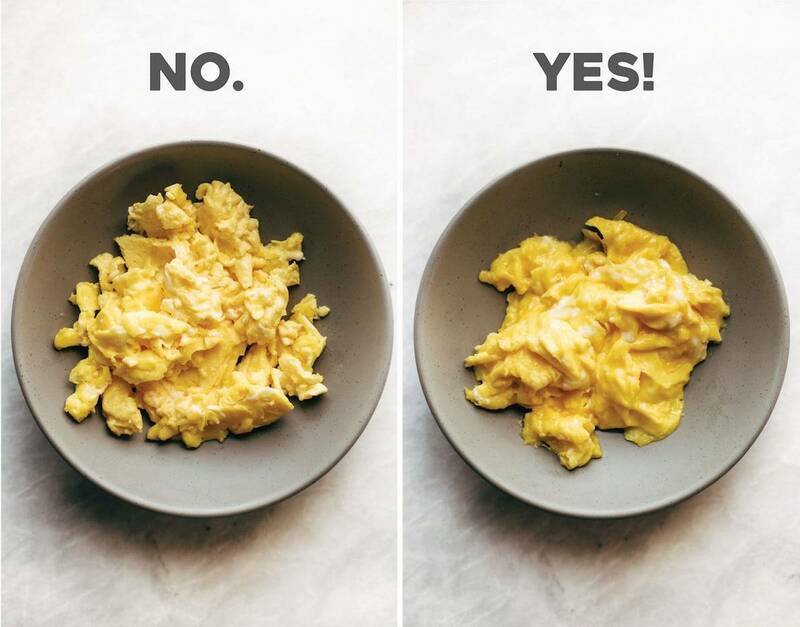 This is how I’ve always done scrambled eggs, so I really don’t know the difference. But, have you tried them in coconut oil? Once I did there was no going back! Only you can get away with publishing a recipe for scrambled eggs and I am saying this in a nicest possible way , love it ! Hahaha, ,my name is Laura too and I laughed out loud at your comment! So true. And yet….there’s an art to scrambled eggs and Lindsay has nailed it. And people like my husband google things like “how do I scramble eggs and not have them all brown” because once in a while, I get sick and am out of commission! I don’t eat eggs often – but when I do, I love finding farm fresh ones! They’re SO much better the regular ones at the grocer. I love soft scrambled eggs with cheese. So good on everything! Yep – big fan of the cheese addition. That sandwich looks crazy good. Now, I’m really hungry! this is very similar to how i make my eggs…and it is life changing! I am also really picky about my scrambled eggs, and over time have learned the slower you cook them the better! It takes longer, but it’s totally worth it! Yes – I’ve heard that! And the ONION DIP! YOU GENIUS! Whaaaaat? You can eat poached and soft boiled and even hard boiled eggs but not scrambled? I am completely the opposite! Those whites creep me out, all rubbery and slimey; I need them mixed in with the yolks. Scrambled eggs & omelettes FTW!! I know, I’m weird about eggs. But I’m coming around thanks to these! totally agree on small pieces of scrambled eggs. Reminds me of something people bring you when you are sick. 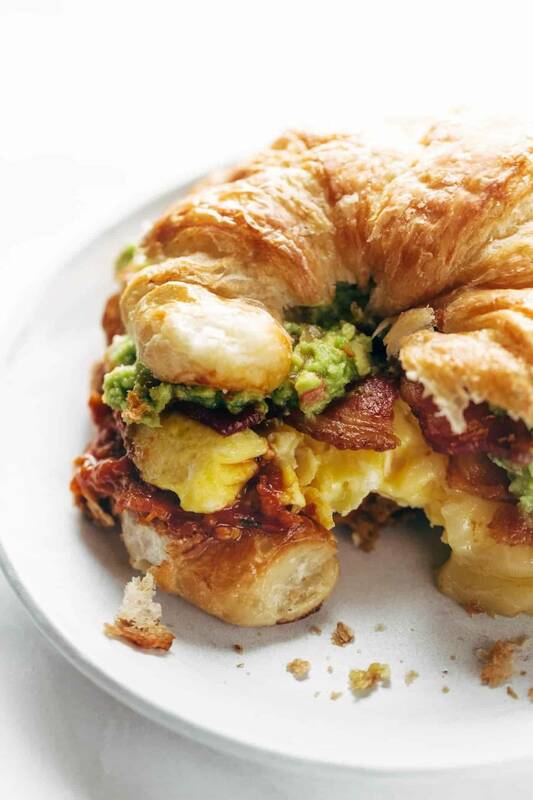 Love the croissant sandwich which is perfect for perfect eggs. I really appreciate this recipe, since our growing-up scrambled were a bit on the browned side. My husband introduced me to soft scrambled eggs, and a wise friend taught me to add a bit of water, not milk, before cooking to avoid watery eggs (yuk!). Kudos to you for using my absolute favorite kitchen utensil – a rubber spatula!! Water!! Who knew. I will try! A splash of seltzer water (fizzy water) helps make fluffier eggs. I add water too! I believe that it adds to a more fluffier airier scrambled egg. Long long ago I use to add milk but they were never as good when I switched to water! I use the eyeball method for measurement so I’m not sure how much to tell someone to add other than maybe a small slash like 1/2 tablespoon or so. Butter use is centuries old; however lest we forget many died at 30 in the Middle Ages, few saw 60 in the 1700’s and our long lives require us to balance fat, sugar intake. I’ve always used water in my soft scrambled eggs (lactose free eggs) and the curds are soft and wonderful—made an egg eater out of my grandson. Yes, please bring yourself up to date with current nutritional science. Real, whole natural fats are not our enemies. YES! I was so-so with scrambled eggs my whole life till Bon Appetit taught me the right (read: soft scramble) way to do it. It is shocking how often I’ll get badly scrambled eggs at a restaurant. Right? It feels like something I / everyone should have learned as a prerequisite to adulthood. Yay!! This makes me super happy. These are exactly are you say – life changing. As a person who makes scrambled eggs for breakfast at least 3x a week, I just made these and WOW what a difference!!! I can’t believe I’ve gone my whole life stirring them so much. Thank you Lindsay for this post! I will try these for sure! But you really need to try Sir Ian McClellanan’s version at least once. Heaven!! Okay I know this is going to be a super unpopular opinion, but I kinda…like….”hard” scrambled eggs. And I fry my eggs over hard too. *insert wide eyes emoji* THAT BEING SAID, however, I am slowly developing a taste for the ~*softer*~ side of eggs, and am going to try this recipe tomorrow morning. Hugs! wahhhh! 😭 I’m kidding, hahaha, thank you for your honest opinion. Bjork is the same way! But I am all about the soft eggs. Thank you Lindsey! I love these … and usually magic green sauce or sunny paris seasoning (or roasted szechuan salt and pepper used as a finishing) I adore my silicon spatula too! I love reading about what you’re up to. Such an inspiration ! Yummm! love Magic Green Sauce with eggs. My grandfather was the one who introduced us to soft scrambled eggs and we haven’t turned back since. Our added trick is mixing in some milk to the eggs before you put them in the pan – takes the creaminess to a whole new level! I see in the comments someone else is also intrigued with the sandwich. Looking forward to your take. I’m always on the lookout for unique sandwiches to surprise my wife and daughter with. I need this for breakfast sandwiches, fried eggs are too dry and/or messy if they’re over-easy, and standard scrambled are too “curduled” so soft scrambled looks like the perfect fit, thank you! I LOVE eggs:) There are so many ways to cook them and soft scramble is one of my favorites. Thanks for sharing your method, sometimes it’s hard not to over cook or undercook the eggs, your pictures are very helpful.